Maricopa and Phoenix Railroad, Arizona - "doodlebug"
I am researching some historical facts regarding the 1887 railroad that went from Maricopa Arizona to Tempe Arizona and then to Phoenix by the Maricopa and Phoenix Railroad. I have an old picture undated of the train used and heard it was called a "doodlebug". It was used to transport passengers to the Phoenix area as they did not have a rail line at that time and Maricopa was the closest east/west connection point to the Southern Pacific railroad. It does not look like a steam locomotive to me. What type of train was used and what number was it? I know the company was incorporated in San Francisco and operated in Arizona and was not affiliated with SPRR. I also know it changed names to the Maricopa & Phoenix & Salt River Valley RR and then a few years later back to its original names. Are there any pictures other then the one I have on it. Doesn't appear to be much detailed information available on the Internet regarding this train and rail road. I live in this town now so I am very interested to learn its history from when it first started as Maricopa Wells, then Maricopaville, and then Maricopa in the 1880's. I am also trying to locate any surveys or maps that detail the exact route it took from Maricopa to Tempe though the Indian Reservation. I have read on some sites that they believe state highway 347 is built on top of the old train tracks sometime around 1935 but no proof has been able to be found to support that claim. It does make sense that they would have used the same route for the highway since it is what I travel to get to my work in Tempe. This rail road was the turning point of the development and growth of the Phoenix area so I am very surprised not more information is available. I can not even find an old photograph of the July 4th 1887 first train to Phoenix ceremony as apparently the city of phoenix celebrated it with huge fan fare. Any info on this train such as manufacture, model type, train number, pictures, etc. would be great appreciated. This is a McKeen Motor Car manufactured by a subsidiary of the Union Pacific Railroad. They were in common use in the first quarter of the 1900's. Thanks for your information. If this is from the early 1900's era then this would not be the first train they used in 1887 by the Maricopa and Phoenix Railroad. Any idea what the train was in 1887? It made its first run from Maricopa to Phoenix on July 4th 1887. The car is a McKeen gas powered motor car, built by the McKeen Motor Car company, a subsidiary of the Union Pacific. 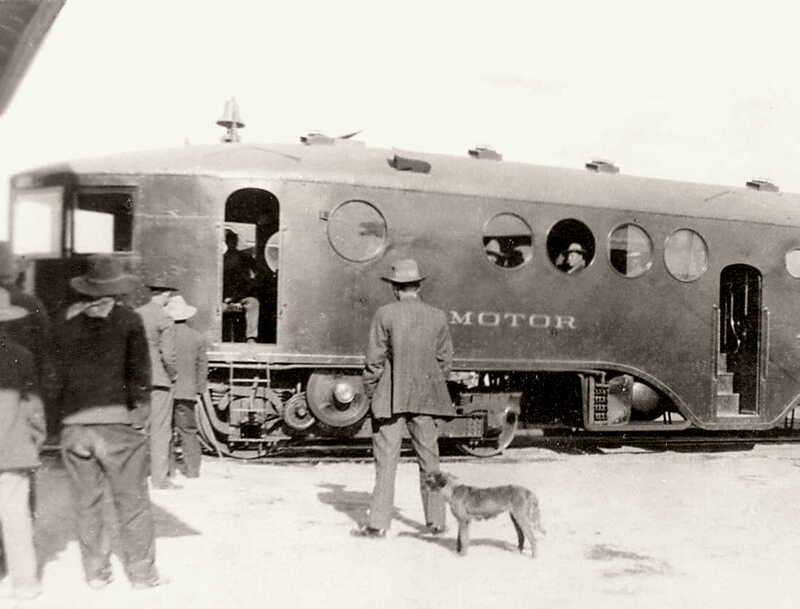 The Maricopa & Phoenix purchased two McKeens in August 1909, numbered M&P #1 and 2 – both 55 foot standard McKeen cars. By this time the M&P was controlled by the Southern Pacific, although still a separate company. On December 27, 1909, the Maricopa & Phoenix consolidated with a number of other Arizona and new Mexico railroads into the Arizona Eastern (cars AE #1 and 2) – see the 1909 consolidation agreement. In 1924 the Arizona Eastern became part of the Southern Pacific (cars SP #69 and 70). The cars were scrapped in 1934 and 1935. ... Suggest you look in David Myrick's book, Railroads of Arizona. Very good info you provided me. Thanks. Would you by chance know what was their first train used in 1887 when they made their historic first run from Maricopa to Phoenix on July 4th 1887? On that date I would assume it would have had to been a steam powered train. Any info you can dig up on that date would be greatly appreciated and any pictures would be wonderful. Yes, in 1887 the train would have been steam – but I haven't found much more on it. Have you checked David Myrick's Railroads of Arizona, volume 1. It is no longer in print, but should be in your local library. He details the history of the M&P. Also, the Arizona Historical Foundation in the Hayden Library at Arizona State University, Tempe has a wealth of historic photographs of the M & P. And while there, you might scroll through some of the microfilm of historic newspapers at the time of the railroad's completion – local newspapers were railroad boosters and you can expect the completion of the line to be front page news. The ASU library is on my ticker list of places to visit to gather more info. Do you know if they typically allow you to scan any photographs into electronic format? I found a copy of David Myrick's book on Amazon and ordered it last weekend. It should be in this week and I am looking forward to reviewing it. You are correct that this was a big event and would have been huge news. Some accounts I read the city of Phoenix had a band playing on the arrival of this train which also happened to be the 4th of July that day in 1887. How many railroads were built by the Chinese? Firearms owned or purchases by C.P.